Love Is In The Air [D6069] - $6.50 : Yarn Tree, Your wholesale source for cross stitch supplies. 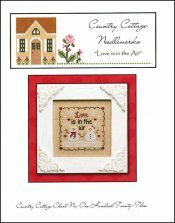 Cross stitch pattern by Country Cottage Needleworks. All we need is love! Standing side by side, joining hands, Mr. & Mrs. Snowman are enjoying the day in the cold, frigid air. With a scarf around his neck & a bow in her hair, "Love Is In The Air." Stitch count 70w x 70h.